May 1, 2016; Fort Lauderdale, FL, USA; Smashing Pumpkins member Billy Corgan performs at the Broward Center. The Smashing Pumpkins began their show at the Wells Fargo Center Saturday night with starlight on the screen, while pictures of past albums flashed before attendees' eyes. As cheers erupted, the screen split and Billy Corgan slowly entered out onto the stage. Alone with his guitar, he began playing “Disarm” whilst images of his childhood flashed behind him. The song ended and the stage opened up, welcoming the rest of the band, including original members James Iha and Jimmy Chamberlin. Three and a half hours were spent Saturday night well in the twilight of The Smashing Pumpkins’ dreamy, thrashy, and melodic music. Imagery in the same vein embodied in the videos played on the backdrop of the stage. For those who are diehard fans of “Siamese Dream” and “Mellon Collie and the Infinite Sadness,” this was the concert for you. The show was an in-depth trip through Smashing Pumpkins’ earliest and most famous work, including hits “Today,” “Cherub Rock,” “1979,” “Tonight, Tonight,” and “Bullet with Butterfly Wings.” The show even featured three cover songs: “Space Oddity” by David Bowie, “Landslide” by Fleetwood Mac, and “Stairway to Heaven” by Led Zeppelin. The show was executed beautifully on behalf of the entire band, including Corgan, who sang with passion and can still wail “cage” with plenty of rage in “Bullet with Butterfly Wings.” Their styled performance was met with a mesmerizing and lucid goddess-like storyline that played throughout a few songs on the screen behind them. The imagery stuck with you, from a woman worshipping a god in tears as 1930s-styled makeup falls down her cheeks in "Stairway to Heaven" – to a goddess circle birthing a new "star" as a woman emerges in "To Sheila." As the show winds down, Iha mentions, “Congratulations on the Super Bowl,” while Corgan nods proudly and fans cheer. Corgan then steps up to the mic to thank the fans for coming, adding, “On a personal note, it’s pretty cool to play here under Dr. J’s swag,” pointing towards the banner that hangs above the arena. “Muzzle” was played last, with a slight interim that welcomed the encore. 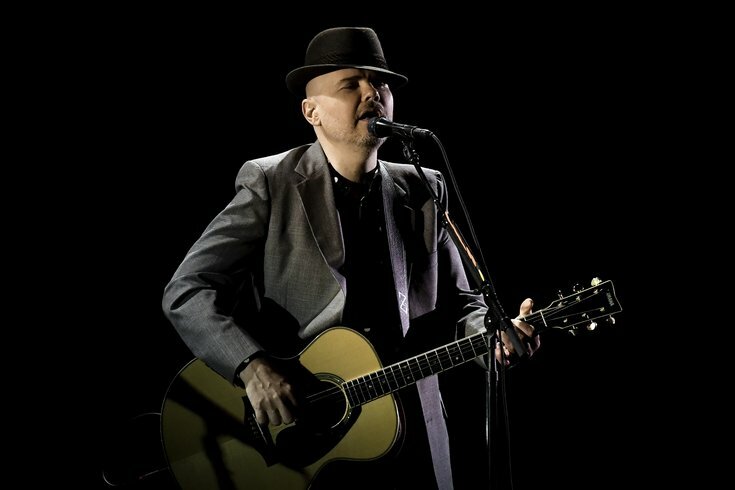 “Solara,” the band’s new single released just this year – and the only song on the setlist recorded post-2000 – was played with high intensity and the show ended with Corgan bringing his son out onto the stage. He sang “Baby Mine,” a gentle lullaby from the Disney movie “Dumbo,” softly cooing the audience, and his son, a goodnight.